Unistrut Telespar Sign Post System | Unistrut Service Co. | Unistrut Service Co. The Telespar sign post system consists of square, perforated, welded steel tubing in eight sizes and three gauges. Perforations or knockouts on all four sides allow you to mount signs on all four sides, back-to-back, and on adjacent sides. The unique manufacturing method used to produce our squared sign post permits tubular sections of different sizes to telescope into the next larger size making adjustment, reinforcement and splicing fast and easy. Telespar tubing’s square shape also provides superior wind load capabilities and torsional stability. The telescopic sign post system can benefit any size town, county, or state highway system department by saving time, money, and lives. The versatility of these telescopic sign supports creates a system adaptable, not only to signpost usage, but also to identification signage, parking meter posts, barricades and countless other applications. 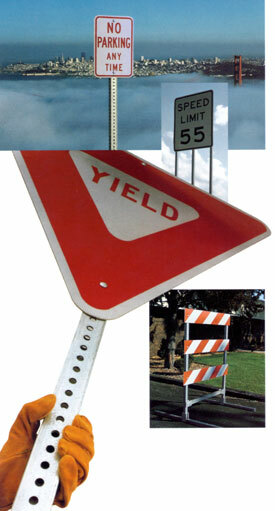 An average 60% salvage rate makes Telespar sign post supports one of the most economical systems available. A major portion of a damaged sign post can usually be saved and spliced with another Telespar section to produce additional posts, to form a cross member, or for other general framing. This multitude of second uses adds up to savings instead of accumulating piles of useless damaged sign posts. Sign Post Supports With Torsional Stability… Primarily because of its square shape, Telespar sign post tubing has excellent stability and protection against twisting. The utilization of Telespar sign posting tube means substantial reduction of sign flutter in high wind, and less loosening and damaging of sign blanks. In many applications, a single highly stable Telespar sign post will do the job of two U-Channel posts. The Telespar sign post system was the first to be used effectively in a yielding breakaway concept for small sign support systems. Our sign post tubing is FHWA approved, and in compliance with AASHTO specifications. Telespar sign supports can be replaced more quickly and easily by a one-man crew than any other signpost on the market. Within minutes, one man, working at ground level, can replace vital traffic signs, thus ensuring that dangerous intersections will not be left without proper signs for extended periods of time. Simply unbolt or remove the rivets from the damaged post, lift it from the anchor assembly, and replace it with a new post and sign. 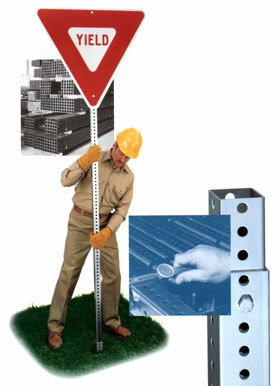 Purchasing Telescoping Sign Posts is Easy! The Telespar sign support system does more–and does it better–than anything else in its class. You simply won’t find better sign post performance at any price. Yet, no other product, including U Channel sign posts, makes available dollars work so hard or go so far. Want to learn more about how the Telespar sign support system can save you time and money? Contact Unistrut Service Company for a quote on all of your sign post needs today!